The Na+-Taurocholate Cotransporting Polypeptide (NTCP) transporter is involved in the disposition and recirculation of bile acids; bile salts secreted into the bile are often re-absorbed into the portal circulation and back into the liver via NTCP. Transport via this mechanism is sodium dependent and electrogenic. Regulation of NTCP copes with changes in bile salt load and expression levels decrease when challenged by a high concentration of bile salts. Although it is not a promiscuous drug transporter, NTCP is a transporter of the widely prescribed, hepatically acting, HMG-CoA reductase inhibitors, notably statins, hence increasing the risk of drug-drug interactions (DDI). Sygnature’s NTCP inhibition assay utilises readily plated CHO-cells expressing the transporter. The endogenous substrate, Taurocholic acid (TCA) is incubated with a range of test compound concentrations. By measuring the uptake of TCA, we are able to measure an IC50 value. 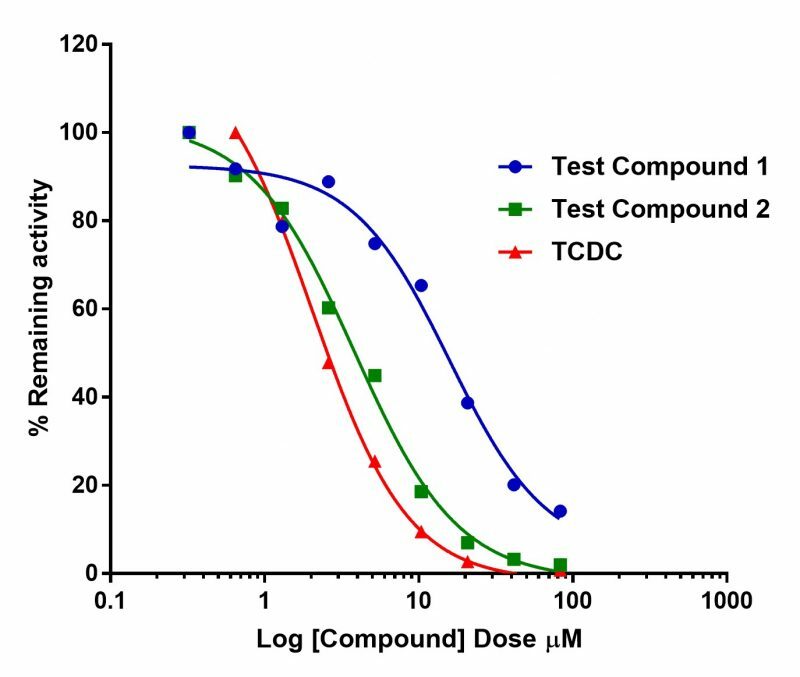 The taurine conjugate of chenodeoxycholate, TCDC, and inhibitor of TCA uptake by NTCP is used as positive control. The experiment is performed in Na-supplemented buffer and sodium-depleted buffer is used to correct for passive diffusion and non-NTCP mediated transport. Na-negative buffer can be used for correction of passive transport. Figure 1. Inhibition of TCA uptake into CHO cells expressing the NTCP transporter by test compounds and TCDC.